5 Bedroom 3.5 Bath Canal Home with private floating dock., "Salt Water Happy". Easy walking distance to the beach access. Soft beach tones, wood flooring,One flat panel HDTV with bluray player and television in the great room, wireless internet access, Blu-ray, newly remodelied,fully equipped kitchen with microwave and dishwasher, washer/dryer. Loft is furnished with daybead, table/chairs and Flat Panel HDTV. 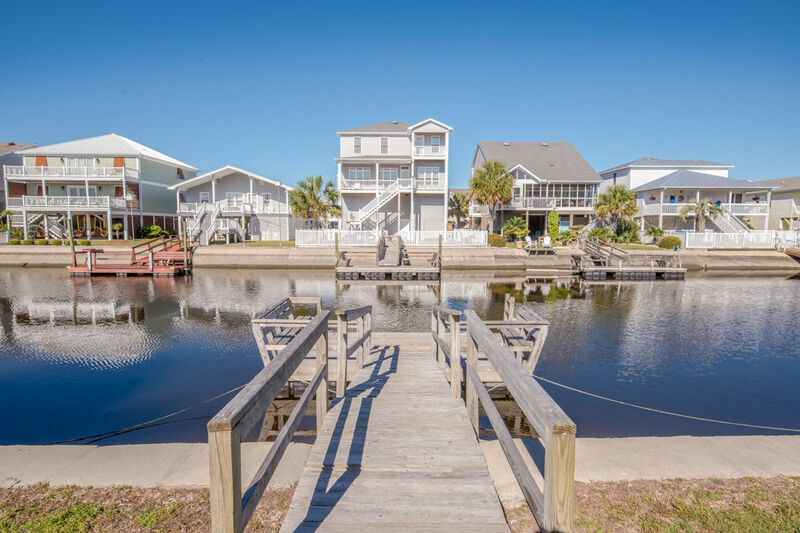 Comfortably furnished screened porch, covered deck, sun deck, floating dock and large outside shower, charcoal grill. Perfect for a comfortable beach vacation or fishing trip. Dog friendly only with an additional non-refundable deposit per dog. Limit 2 dogs. This home has all bed and bath linens provided with beds made upon your arrival. Non Smoking! NO LINENS PROVIDED FOR WINTER/MONTHLY RENTALS. I have been coming to Salt Water Happy since I was a little girl,and I now bring my own kiddos here each year. We have the most amazing time laughing and creating memories together. With traditional beach decor and inviting living space this home is a wonderful place to stay with your family. The outdoor space is perfect for morning coffee,mid day reaching or evening chats as the sun goes down. Less than a mile from the beach makes walking or driving extremely easy and enjoyable. This house has everything to be your next home away from home while you vacation ? Loved the house. The location was awesome. The house had everything you would need. Plenty of space. Great outdoor space and an outdoor shower. Would definitely stay there again. My husband and I wanted to take our children and grandchildren to spend quailty time together. It was an awesome home. We had the best time. The only thing that would have made it better if there had been more Tv's. The TV downstairs was great but with having little ones... the upstairs TV was too small. It would be nice to have a TV in every bedroom. But overall the was awesome!!! If you are looking for a beautiful ..large..clean home...This is it!! !